Gift packaging to support joints during active lifestyle. The combination of active substances in our instant drink supports the movement and flexibility of joints, helps regeneration of connective tissue, lowers infections, pain and swelling. Special body gel will care for your muscles, tendons and joints. Gel warms them up and releases before any sport activity or during the day. Gel is in this packaging for FREE. FLEXIT GOLD DRINK 400 g - orange flavour: is an extraordinary instant drink containing nine active ingredients with a great nutritional and physiological effect. 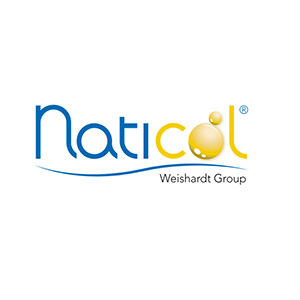 The most important active substances are found in the special fish collagen peptide Naticol®, produced by enzymatic hydrolysis, which stands out because of its low molecular weight. Another active ingredient is methylsulphonylmethane (MSM), which contains organically bound sulphur. Among the active substances, we should also mention vitamin C, which contributes to the normal formation of collagen, Boswellia Serrata, hyaluronic acid and vitamin B6, which contributes to the normal metabolism of protein and glycogen. Vitamin D contributes to the normal utilization of calcium and phosphorus, used to build up bones and teeth, and further strengthens immunity. 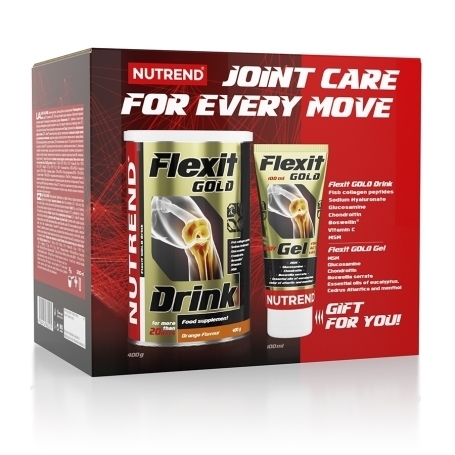 FLEXIT GOLD GEL 100 g: is the newest addition in portfolio of NUTREND company. It is fast absorbing massage gel, used to massage in strained joint and muscle areas. FLEXIT GOLD GEL is part of the functional product line FLEXIT and is perfect to combine with one of current products in this line aimed for complete care of connective tissue. The effect of warm or cold feeling in place of application is not at fault and will help release tightness in strained areas. Use: Slowly massage adequate amount to skin in muscle, joint and spine areas. FLEXIT GOLD DRINK Orange flavour: hydrolyzed fish collagen 25 %, gelatine hydrolyzate, maltodextrin, glucosamine sulfatepotassium salt (origin in shellfish), chondroitin sulfate, acidity regulator citric acid, flavouring, MSM (methylsulfonylmethane), Boswellia serrata extract (20 % beta-boswellic acid, 10 % acetyl-keto-beta-boswellic acid) – Boswellin® PS, acidity regulator malic acid, L-ascorbic acid (vitamin C), stabilizers acacia and xanthan gum, anti-caking agents calcium phosphate and silicon dioxide, sweeteners sucralose and steviol-glycosides, hyaluronic acid (sodium salt), pyridoxine hydrochloride (vitamin B6), cholecalciferol (vitamin D), colouring agent beta-carotene. The product contains allergens fish and crustaceans. It may contain traces of soy and milk protein. FLEXIT GOLD GEL: Aqua, Propylene Glycol, Alcohol Denat., Lecithin, Sodium Acrylates Copolymer, Glucosamine Sulfate, Dimethyl Sulfone, Sodium Chondroitin Sulfate, Boswellia Serrata Extract, Vanillyl Butyl Ether, Methyl Salicylate, Menthol, Eucalyptus Globulus Leaf Oil, Cedrus Atlantica Bark Oil, Phenoxyethanol, Ethylhexylglycerin, Limonene..